It is time for What I Ate Wednesday again. For the possibly five people in the blog world who do Not know what that is, it is the Fun Food Fest hostessed each week by the lovely Jenn at Peas & Crayons. 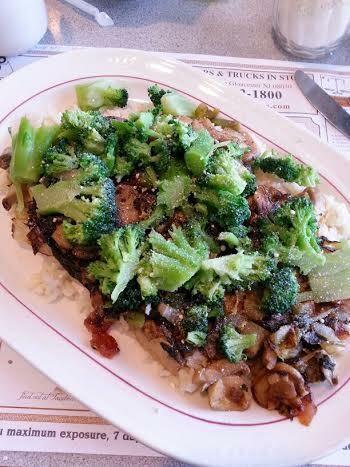 When you’re finished here, be sure to visit P&C to see what everyone has cooking over there! As usual, every month is Love Your Veggies Month here at BCDC. Let’s see what’s on the menu. One of my favorite meals in the whole world, one because it’s Delicious, and two because it reminds me of the sandwiches my Mom would make us when we were kids. 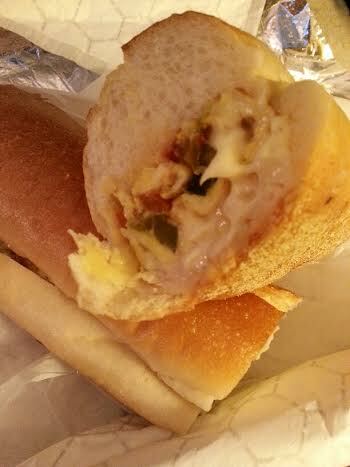 Pepper and egg sandwich from the local pizzeria. My change to it is having them use sweet peppers instead of regular and adding some American cheese. So good! 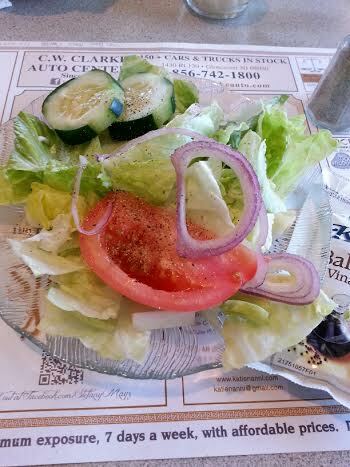 Salad at the diner. I had forgotten to take my balsamic vinegar with me so I survived using their balsamic vinaigrette, just not much of it. 5 Points for the entire package…No Thank You. 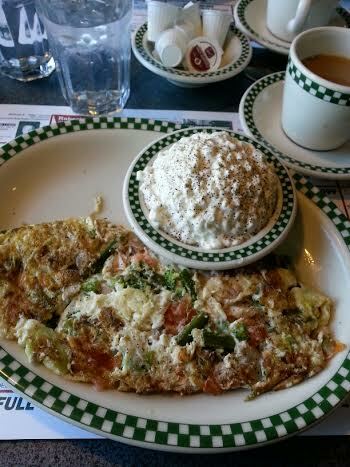 One of my favorite things to do at the diner is to come up with things I can eat by using what they have on the menu. They have a sandwich called a veggie cheese steak. It is a big roll with a grilled combo of mushrooms, onions, romaine lettuce, peppers and a bunch of other veggies topped with cheese and it’s delicious. But sometimes I don’t want to eat all if that bread so I decided I’d ask if they would put it over rice. They said yes and I get a side order of brocolli. Then I just sprinkle Parmesan cheese on top. So Very Good! 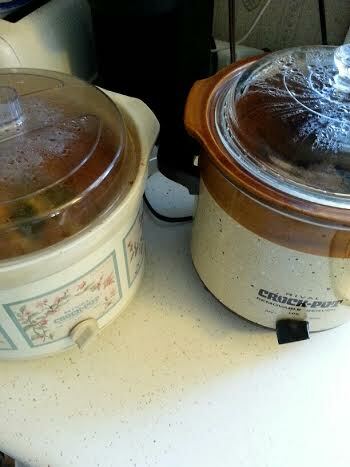 Monday at my house it was Two Crock Pots, No Waiting! 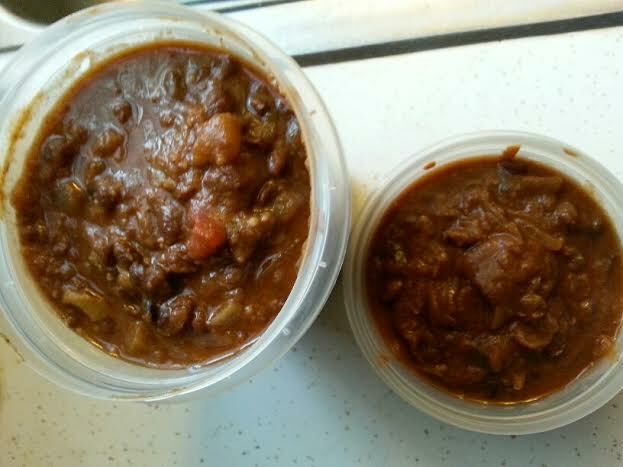 The one on the left is my Weight Watchers veggie soup bubbling away. On the right is Ralph’s country ribs cooking, soon to be topped with barbecue sauce. It’s one of his favorite meals and it’s easy for me. He usually gets at least two meals from it and that again, is a good thing! 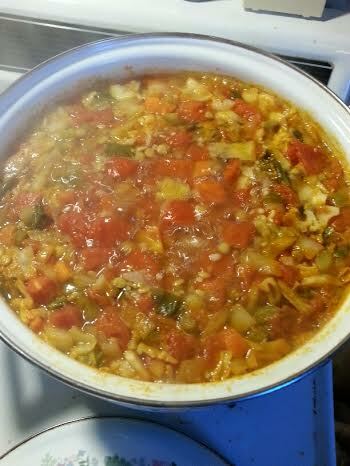 How many different ways can I show you my Weight Watchers veggie soup? This time it’s cooked. This is so good and makes the house smell so good as it cooks. I get so many meals out of it that it’s crazy! It goes a very long way and it’s very inexpensive. One of these days, I’m going to try to figure out how much it costs. Not a lot, I can assure you. It’s a wonderful tool for me on Weight Watchers because it counts as 0 Points. Sounds good to me. So that’s WIAW for me for this week. Be sure to stop over to see what all the fuss is about at Peas & Crayons. Just be careful, because I usually end up incredibly hungry after checking out all of the blogs over there. Eat breakfast first!! Here it is Wednesday again and of course time for What I Ate Wednesday hostessed by Jenn at Peas and Crayons. This lovely young lady knows how to throw a food party so be sure to head over to P & C when you’re finished here to see what everyone else has to share. Here goes! I’m still loving my veggies so let’s see what I’ve got…in no particular order. 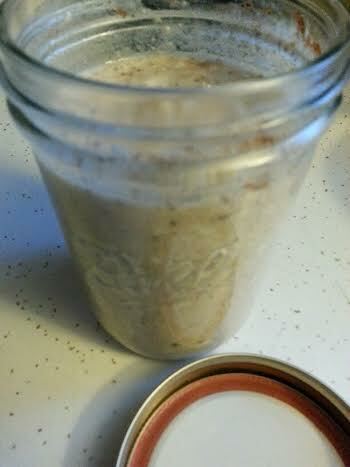 I love overnight oats but always forget to make them in the evening. So this morning, when I finished breakfast, I made tomorrows oats! I can be so smart when I work at it! I know that cabbage gets a bad rap sometimes, but I love it. 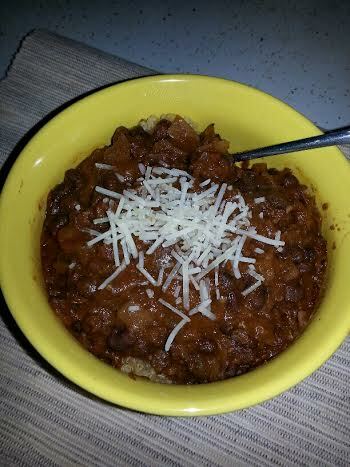 This was chopped up with onion, garlic carrots and canned white beans (all that I had on hand) and topped with parmesan cheese. There’s brown rice hiding underneath. Very good. This was a delicious wrap at one of our favorite pizza places. 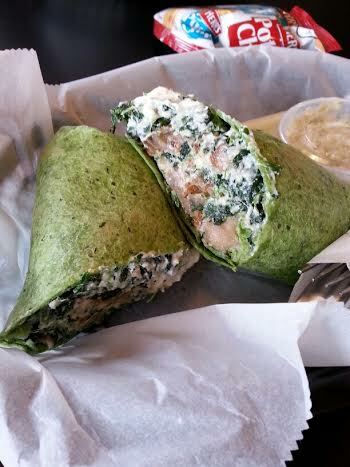 A spinach wrap with eggplant, spinach and ricotta. Only thing I would change for the next time is to as them to simply grill the eggplant rather than bread and fry it. Otherwise delicious! Of course the chips went to Ralph. 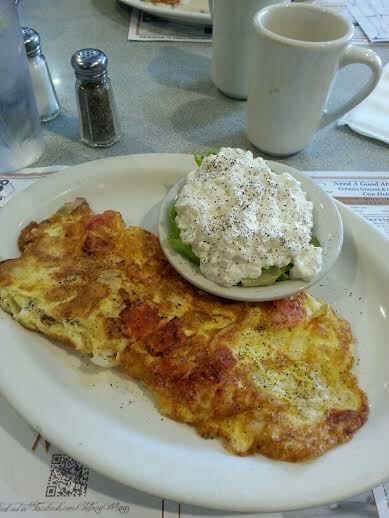 As my friend Meghan at Clean Eats, Fast Feets likes to point out, it wouldn’t be WIAW without a diner omelette. 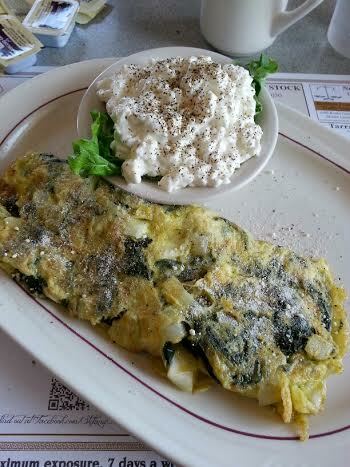 Here’s an especially good one-onion and spinach with of course a side of cottage cheese! 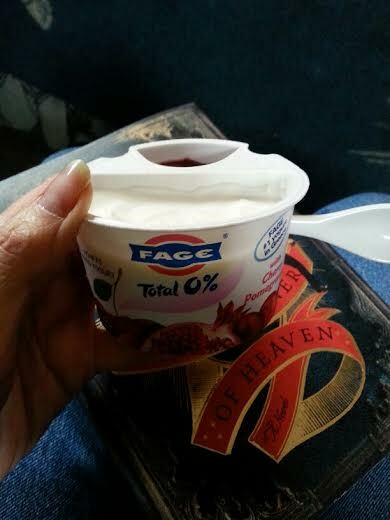 One of my new favorites, Fage Greek yogurt. I’ve been finding it at Aldi for a much lower price than other stores. Of course, I’m taking advantage of it! Great afternoon snack. One of my favorite meals this week. I made my usual lentils in the crock pot. I put a chopped onion, chopped garlic and Mrs. 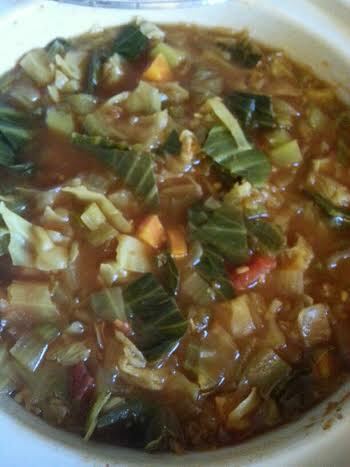 Dash along with 1 cup of rinsed lentil and veggie broth to cover by about an inch. I cook for several hours, I’m not sure how long because it seems to depend on the day. Usually about four hours. 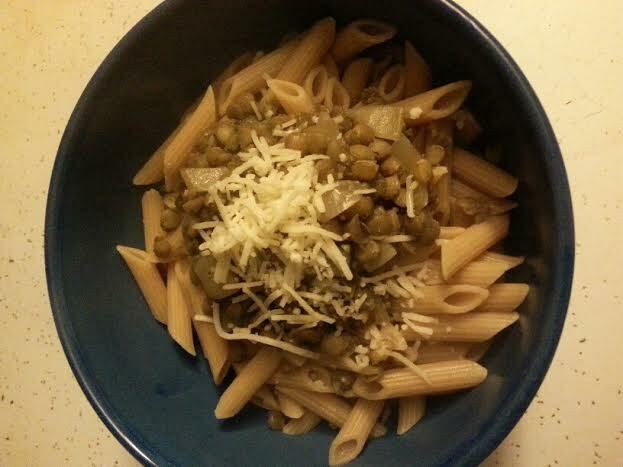 I cooked up some whole wheat past and topped it with the lentils and some parmesan cheese. This was so delicious. I have enough lentils left for another serving. That may be tonight’s dinner. So that’s What I Ate Wednesday for me. Be sure to check all the fun over at Peas and Crayons. I always find great ideas and suggestions. Back on track and in the routine! What I Ate Wednesday is such a fun link up to participate in. Everyone is positive and the food is so colorful. I get so many great ideas. Even from the posts with meat…I’m looking at the sides and getting ideas. Thanks as always to the beauteous Jenn at Peas and Crayons for hostessing the food fun fest. Be sure to check out all of the other linkers when you’re finished here. It’s ALWAYS love your veggies month around here. 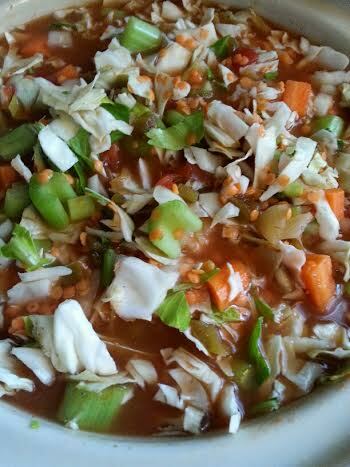 Started off the week with a nice crock pot filled with Weight Watchers veggie soup. This always looks so delicious and it is! Found some red lentils while foraging in the pantry. They added a nice protein punch. Yummy altogether! We went out to lunch with our grandson Alex and his Mom for his birthday. I started with split pea soup. 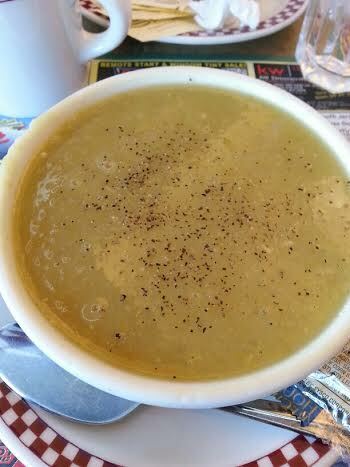 Why split pea soup? No Ham!! Our waitress told me that she grilled 3 different cooks to be sure there was no meat in here. It was really tasty too. She said that alone should bring us back again. It will! 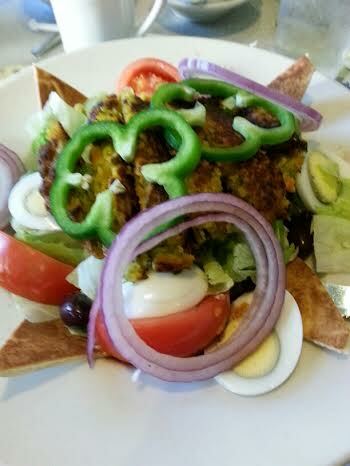 This salad was supposed to have salami on it but I swapped that for a veggie burger. Really good! The waitress bet me I couldn’t finish it. I won! Breakfast at one of our favorite diners. This was an egg white omelette with mushrooms, tomatoes, onions and asparagus. Side of cottage cheese of course. So good. On Saturday we splurged and took my sister Ele out for Chinese food. 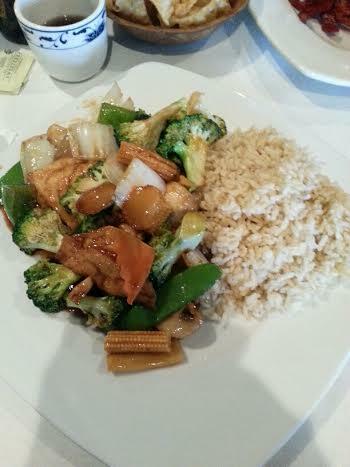 One of my usual choices-Veggie Delight. It was very tasty. The lunch size portion is just right. 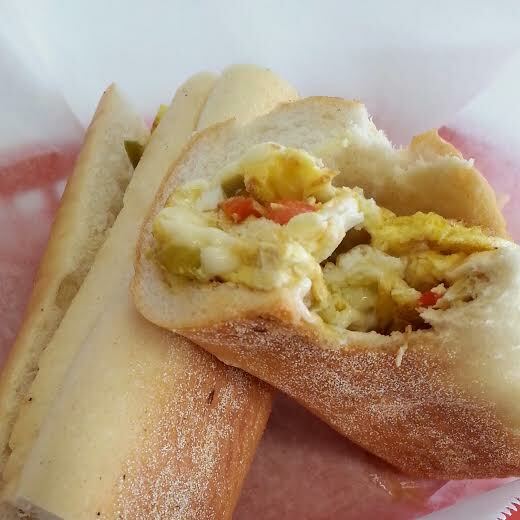 Pepper and egg sandwich from our local pizzeria. It’s supposed to be made with regular green peppers but I ask them to substitute the sweet peppers instead. So good that way. I’m trying to pump up my protein and I love Greek Yogurt. At Aldi, I found Fage Greek Yogurt. At 3 Points, great for an afternoon snack. 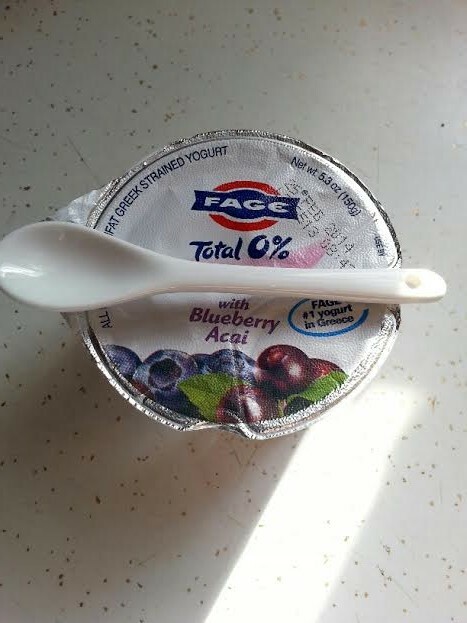 I had never tried Fage but the price was right at Aldi. This was cherry pomegranate. Very tasty. I don’t like the shape of the container though because you can’t get all of the fruit out. I ended up using my finger! Well worth it. I have a blueberry-acai waiting for me in the fridge for today’s afternoon snack. As advertised…Lots of Veggies but that’s really the way it usually is for me. I love veggies because for me to stay satisfied on Weight Watchers, I need volume. Veggies give me the volume I need to feel full and stay within my Points. That’s it for me for this week. Be sure to check out the other fantastic foods at Peas and Crayons. I have missed being a part of the link ups that I love to join and especially What I Ate Wednesday. It’s always so much fun. I did join back in last week but this week is feeling even better. Be sure to stop over to Jenn’s party at Peas and Crayons when you’re finished here to join in the fun! Let’s get started. Let’s start with a snack…why not! It doesn’t look as good as it tasted. 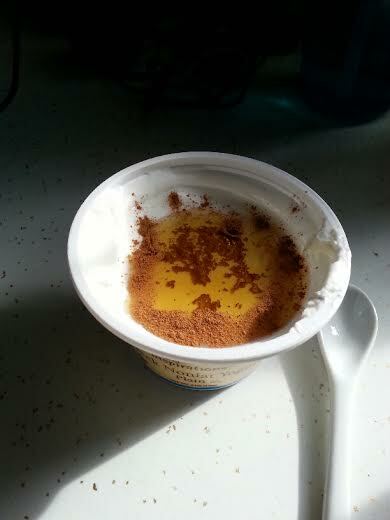 I found plain Greek yogurt in individual containers at Bottom Dollar. I add cinnamon (of course!) and honey. This is so good and it feels like I’m eating something I shouldn’t. All of that protein is very satisfying. I’m getting into smoothies lately. But with a non-freezing freezer at the moment, I can’t buy frozen fruit…well, I can but it isn’t frozen for long. Ralph bought me this mango at the local Wawa. I thought it was a great idea to turn it into a smoothie. This was ok. 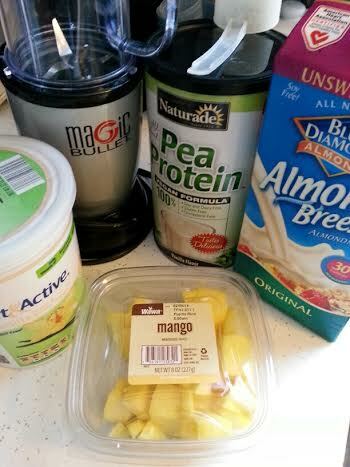 The mango didn’t really add any flavor to the smoothie. If it wasn’t for the cinnamon and nutmeg it wouldn’t have tasted much like anything. I’ll finish off the mango but I’ll cross it off the list. Guess I’ll just have to deal with defrosted frozen fruit. At least there’s some flavor. Yesterday it was snowing…what a novelty! 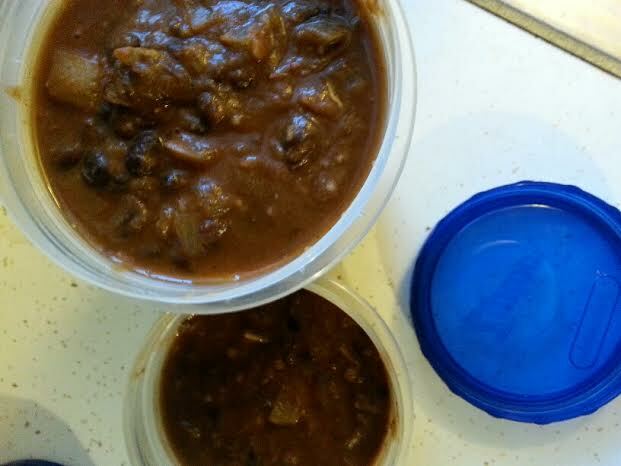 I decided that a nice pot of black bean soup (so easy!) was in order. It makes enough for several meals especially since it’s too spicy for Ralph, but in truth it’s not really spicy. He’s just not a spicy guy…at least when it comes to food! I put the black bean soup over quinoa. It is so good and filling. I love this every time I make it. I’m getting hungry looking at this photo as I type! I’ve talked lately about feeling not on track and kind of out of sorts. I do want to say that things are starting to come around. I’m feeling much more in control of my food and life in general. If the snow and cold would ever go away, I’d be all set! That’s it for me for today. Be sure to head over to Peas and Crayons to see what Jenn and the other kids have to share. Where have I been?! I have no idea. In a fog somewhere. I have missed being a part of Jenn’s What I Ate Wednesday party over at Peas and Crayons. I’m here and ready to talk about and look at some yummy food. Be sure to check out the other bloggers over at Peas and Crayons when you’re finished here. These are some meals from the last few weeks. The weeks when I haven’t been showing up here. Except for today’s breakfast, I’m not sure what is from when so I’ll just dive in. 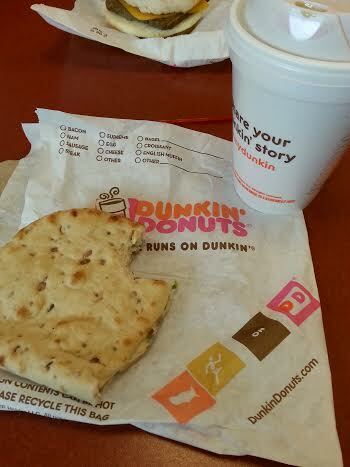 A Dunkin’ Donuts egg white veggie flatbread and coffee. I left the cheese off of the sandwich to save 2 Points. It was 5 Points this way. Tasty! 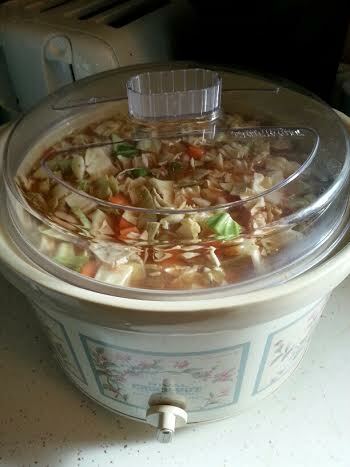 A big crock pot filled with Weight Watchers veggie soup. I should probably review again sometime how I make it. Next time I make it, I will. This has lasted about a week and it’s very tasty and filling. I’m really enjoying smoothies lately. 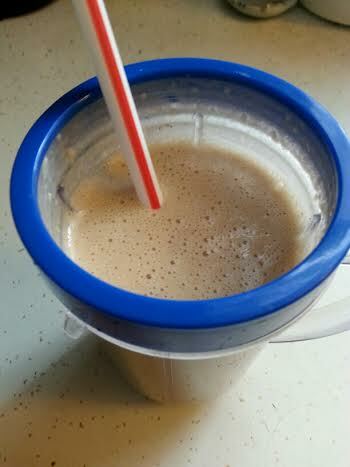 This was almond milk, fat-free vanilla yogurt, protein powder and some of the crock pot apples I make all the time. This is very tasty. 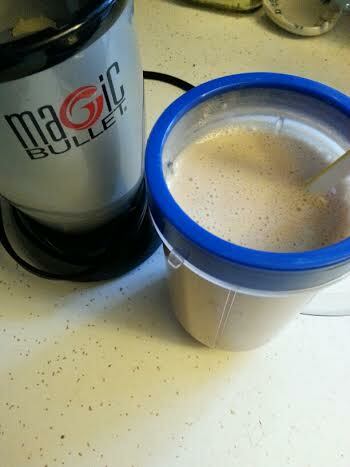 Love my Magic Bullet! Breakfast at one of our favorite diners. 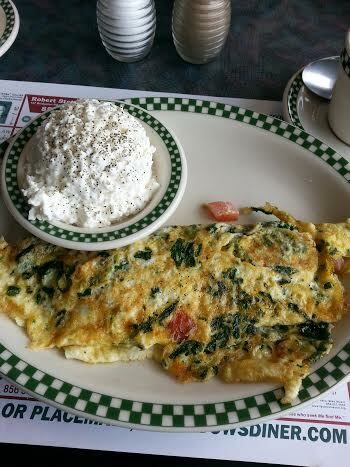 This one is an egg white omelette with spinach, onions, tomatoes and garlic. It comes with the cottage cheese and no toast. It’s great for me…helps me stay on track with Weight Watchers. One of my strange combos. 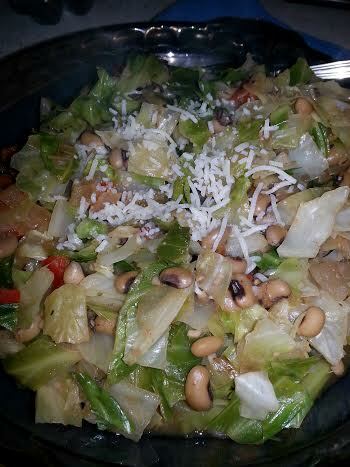 Cabbage, onion, red bell pepper and crock pot black-eyed peas. Underneath all of that yumminess are two small sweet potatoes. I love doing this with sweet potatoes. Topped off with a little parmesan cheese. This next photo is a sad one. I’m calling this the one that got away. It looks so pretty. 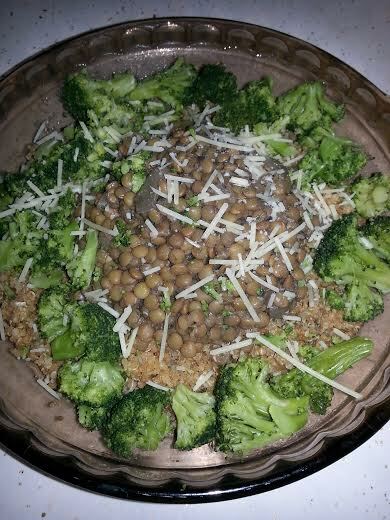 Crock pot lentils with leftover quinoa and broccoli. Problem was…I put it in the microwave to warm everything up. As I was taking it out of the microwave, I hit the door with my hand and the plate went flying across the room. Food all over everything. The only good thing was that the dish didn’t break. I had to settle for a Much less satisfying meal as a replacement. I am trying to cook more. I’m going to the farm market tomorrow to stock up on veggies and start roasting. I love my veggies that way but I don’t do it nearly often enough. I will from now on. So that’s it for WIAW this week for me. I’m happy to be back with the in crowd. Don’t forget to check out all the fun over at Peas and Crayons! Still trying to get my act together here and plugging along. But I can’t miss out on joining in with What I Ate Wednesday in spite of the hubbub. Be sure to check out all of the fun over at Jenn’s wonderful Peas & Crayons. As my title would suggest, it’s all soup all the time around here lately. One of my favorite things to do is to hang out at my stove cooking up lovely pots of soup. Sometimes one of my crock pots subs in for the stove, but either way. I love soup. It makes me happy. Still doesn’t look very pretty, but I don’t care…it’s delicious! 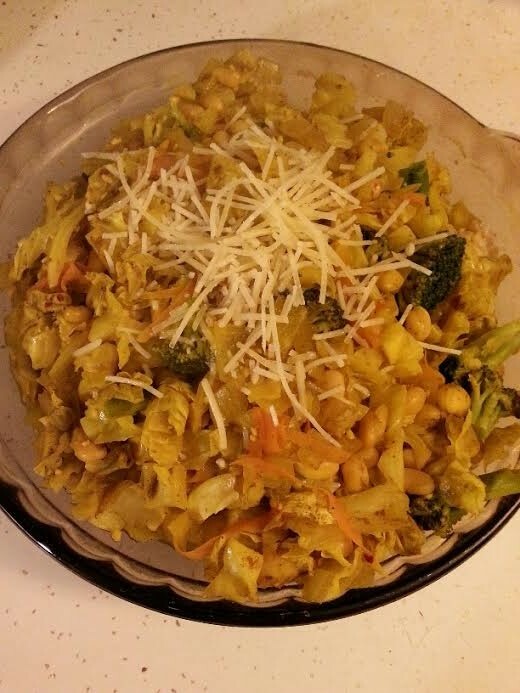 I’ve been finding lots of great veggie recipes courtesy of Facebook. There are lots of pages on there directed to veggie types such as myself. I’ve been enjoying reading them and now trying some of them. One of the ones I like the best is Veg Kitchen with Nava Atlas. This is chock full of good veggie recipes. 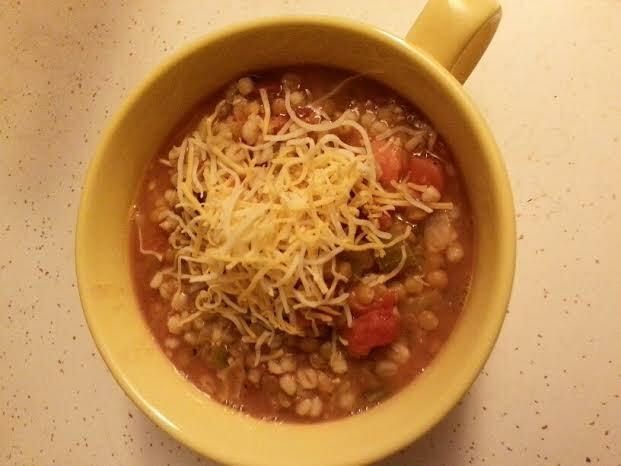 I found one called Tomato, Lentil, and Barley Soup. This was easy for me because I had most of the ingredients already. I’ve been hanging on to that last little bit of barley Forever and there was just enough for this recipe. So colorful and it smelled so good. I do think that it needed a little more seasoning. I think I will at least doubled the Mrs. Dash the next time I make it and maybe add a few more spices along with that. I topped it with some shredded 2% cheese and I loved it. I’ve eaten it two days in a row and I’m probably going for three! That’s one of the things I love about having soup in the fridge…there’s never the question, “What’s for dinner?” I always know the answer…Soup!! I’m going to do my best to keep at it with making soups. They’re very filling and since I’ve been having the soup, I don’t feel so tempted to snack in the evening. That’s always a plus. Be sure to check out all of the fun going on over at Peas & Crayons. We’re getting down to the wire around here with Christmas things so I’ve got to run! Hello…My Name is Fran and I’ve been away from What I Ate Wednesday for Way too long! Truthfully only 2 weeks, but it seems like a lot longer. I haven’t been sitting on my hands during that time (well sometimes because my hands get really cold and that’s the only remedy!) I’ve been very busy accomplishing things around here and I’m quite proud of myself. I guess it was worth giving up WIAW for a few weeks. The projects continue and now I’ve got to get back to some food at least once a week! Thanks to Jenn at Peas & Crayons for being our glorious hostess!! Not JUST on Thanksgiving, but Thanksgiving is certainly in here. Funny thing is, that with everything I’ve been working on, I’ve been forgetting to photograph food. I’m going to work on that in the coming week and get back my blogging skills. 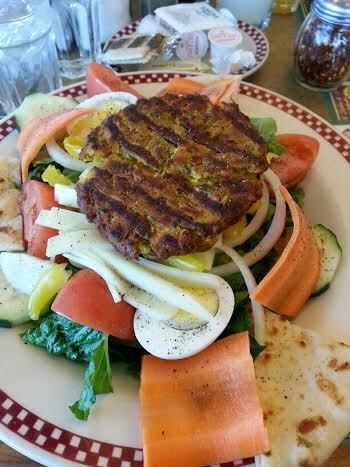 Salad topped with a veggie burger at our favorite diner. It’s one of my favorite lunches. Filling and delicious. Breakfast at the same diner. A tomato and onion omelette. Cottage cheese on the side. This combo just sounded good to me and it was. On Thanksgiving, I wanted a light breakfast so that I would have lots of flexibility at dinner. This was an omelette made with egg substitute and egg whites topped with Fall Apple salsa. Very tasty and filling. 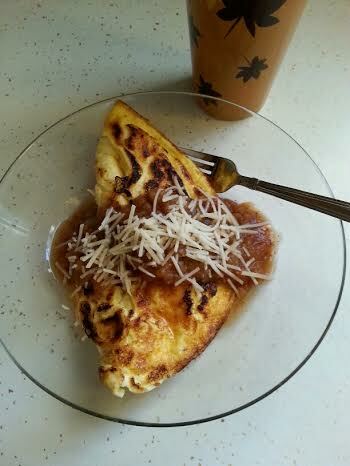 I love making omelettes this way and it only cost me 2 Points on Weight Watchers. Recognize the mug, Ele?! Yummy Thanksgiving dinner at my sister Ele’s house. 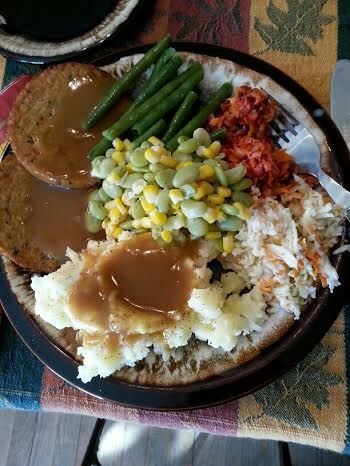 Morningstar Farms turk’y burgers, mashed potatoes topped with Serv-A-Gravy, a wonderful veggie gravy substitute, succotash (an old favorite that I made), green beans, cole slaw and cranberry orange relish that Ele made. All quite delicious. Didn’t get a photo of my cranberry orange mold. Oh well. I also forgot to capture dessert but I had a piece of Jim’s homemade apple pie and piece of Ele’s Andes candies brownies. So good! One more thing that should be accompanied by a recipe but it isn’t today. I will get it posted because it’s delicious and I will be making it again and again. 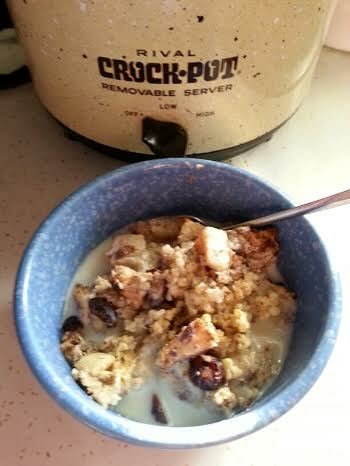 Steel cut oats made in the crock pot. This is so easy and it is so delicious. I was set for breakfast for a week. I’ll try to get the recipe up sometime this week. I’m working hard to get back on track as far as my food choices are concerned. I do feel I kept myself in control on Thanksgiving but I’ve been struggling with night-time snacking again. That is Always my big stumbling block. I’m also working hard to get more exercise which will help. So far so good this week. I’ll try to keep it up. I’m still not feeling Christmas yet. I’ve been dealing with this for that last few years. I’m working at getting the Spirit. We’ll see how it goes. So for now, that’s What I Ate Wednesday for me. Be sure to check out the wonderful group of foodies who gather at Peas & Crayons each week. Humfph…seems the whole thing continues even when I’m not there. That is how it should be! !